Truth by Kbaig: IN PAKISTAN .... WHY OUR DEFENSE ANALYSTS, JOURNALISTS, INTELLECTUALS, & "AMAN KI ASHA" brand COLUMNISTS ARE SILENT over Human crises and genocide of Muslims in Myanmar? IN PAKISTAN .... WHY OUR DEFENSE ANALYSTS, JOURNALISTS, INTELLECTUALS, & "AMAN KI ASHA" brand COLUMNISTS ARE SILENT over Human crises and genocide of Muslims in Myanmar? They blame Pakistan army for violation of human rights in East Pakistan and for 1971 war, knowing that war was imposed by India. (No doubt at that time there was a political unrest in the country, BHUTTO created mess by dishonoring elections and pressurized Yahya to follow him as well; so the India exploited our weaknesses and attacked East Pakistan.) Does our media masters explain that why India rushed to rescue the Bengali Muslims of East Pakistan in 1970, but now silent on the Muslims genocide in another neighboring country? 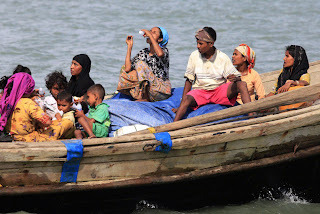 Rather helping them Indian security forces are killing those Burmese Muslims who try to enter in India by boats for the safety of their families, infants and children. India is even not allowing Bangladesh to open border for refugees from Burma. If we look at the history after 70s, in 1974 the military regime of Burma put Complete ban over the nationality of Burmese Muslims (Rohingyas), Declaring them as foreigners, citizenship rights were denied, removed from government jobs and properties confiscated they were made homeless in their own country. Govt. also introduced travel restrictions on them and introduced special identity papers for their movement in Burma. International media ignored the situation and so the world. Therefor the Army government of Burma got encouraged by criminal ignorance of international human rights bodies and introduced new laws to restrict the activities of Islam, demolishing all the mosques in area. What is role of India in this human tragedy? India is propagating that the Burmese Muslims are terrorists, "they fought against Russia in Afghanistan and now a days these Afghan war trained Burmese (Rohingya Muslims) are fighting against Burmese Army..." What an excuse! Actually it is a replay of BOSNIA & KOSOVO type manslaughter of Muslims planned and executed just to penalize SHANGHAI for their close relations with Burmese Govt. and their interests in the region and natural resources of BURMA. No matter what is the plan, conspiracy or who is behind this inhuman genocide, we condemn atrocities against Muslims and protest against the worst gross violations of basic human rights and silence of the whole world as well as human rights organizations over massacre of unarmed Muslims in Myanmar!! !